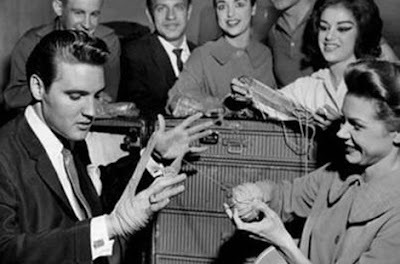 Apparently Elvis Presley went backstage at The Auditorium on the night of March 9, 1962, to say hello to some of his friends in the Holiday on Ice cast, and skating star Dorothy Goos promptly put him to work holding yarn. Pare che la notte del 9 marzo 1962 Elvis Presley ando' dietro le quinte dell'Auditorium per salutare alcuni amici del cast dell'Holiday on ice. La star del pattinaggio Dorothy Goos lo incastro' prontamente per farsi reggere il filato.